Have you guessed what it is yet?? 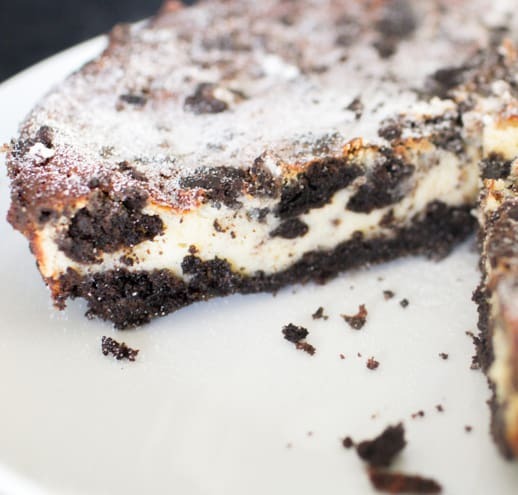 Thats right I made an Oreo cheesecake, honestly this is my idea of heaven on a plate! Here’s something else I didn’t know, you actually have to bake some cheesecakes? Who knew??? Step 1: Heat your oven to 150 Degrees celsius then place half of your oreos in a food blender and mix until fine. Step 2: Melt the butter in a pan. Step 3: Add the butter to the crushed Oreos. Step 4: Spread the crushed the Oreos into a 9-inch baking tray. Step 5: Beat together the Cream cheese, sugar and vanilla in a large bowl with an electric mixer. Step 6: Add the eggs one at a time and mix well. Step 7: Place the remainder of the oreos in a plastic bag and break up with a rolling pin until you have fine chunks. Step 8: Add half the chunks to the mixture. Step 9: Pour the mixture on top of the biscuit base. Step 10: Place in the oven to cook for 45 Minutes. Step 11: Remove from the oven leave to col then place in the fridge for at least 3 hours or overnight. Step 12: Sprinkle with castor sugar and enjoy! I have to admit waiting overnight to be able to taste this cake was like some form of torture but when the time came it was well worth the wait. I swear I think I might have even dreamt of it? For my first attempt this was pretty darn amazing!! Let me know how you do guys? I want to know all about your baking experiences!